Over 560m in height, the Beipanjiang or Duge Bridge is the highest in the world. 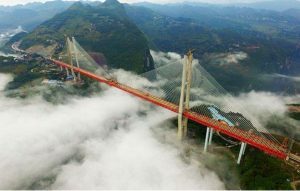 The structure has substance as well as style; this critical stretch of motorway links the cities of Liupanshui and Qujing, reducing travel time by up to three hours. At nearly double the height of London’s Shard, the bridge cost £88m to construct.